Create a stunning water feature with ease with this powerful 2500 Gallon Per Hour Pond Waterfall Pump. Engineered for quiet, powerful and reliable operation, this pump is designed specifically for pond use. Ideal for ponds up to 3000 Gallons and waterfall applications. Ultra Energy Efficient (85-Watt). Includes fittings for 3/4 in., 1 in., 1.25 in. and 1.5 in. connections. Compatibility with most pond applications and equipment. Limited 1 Year Warranty. Visit angelodecor.com for more information. Algreen's MaxFlo WaterFall Pumps all have magnetic driven motors for extended life and increased durability. This MaxFlow, Pumps 1,200 Gallons Per Hour, is for under water use and is ideal for an impactfull Waterfall. The pumps can be positioned vertically or horizontally for various pond configurations. This Pump has a filter grid to protect the motor from large debris, 16 ft Power Cable and is Fish Friendly. This Energy Efficient Pump is U.L listed with a 2 Year Warranty. Reliable, powerful and efficient; Ideal for use in medium to large sized ponds (Up to 750 Gallons). Kit includes: 500 GPH energy efficient pump, pre-filter, 3/4" output, diverter with dual flow control, 3 extension tubes with coupler, 5 spray nozzles: Bell, Foaming Jet, Tiered, Double Tiered and Trumpet. The 80 GPH Medium Solar Hybrid Pump features a battery backup that allows for up to 4 hours operation without sunlight. The battery can be charged by the solar panel or a conventional electrical plug. 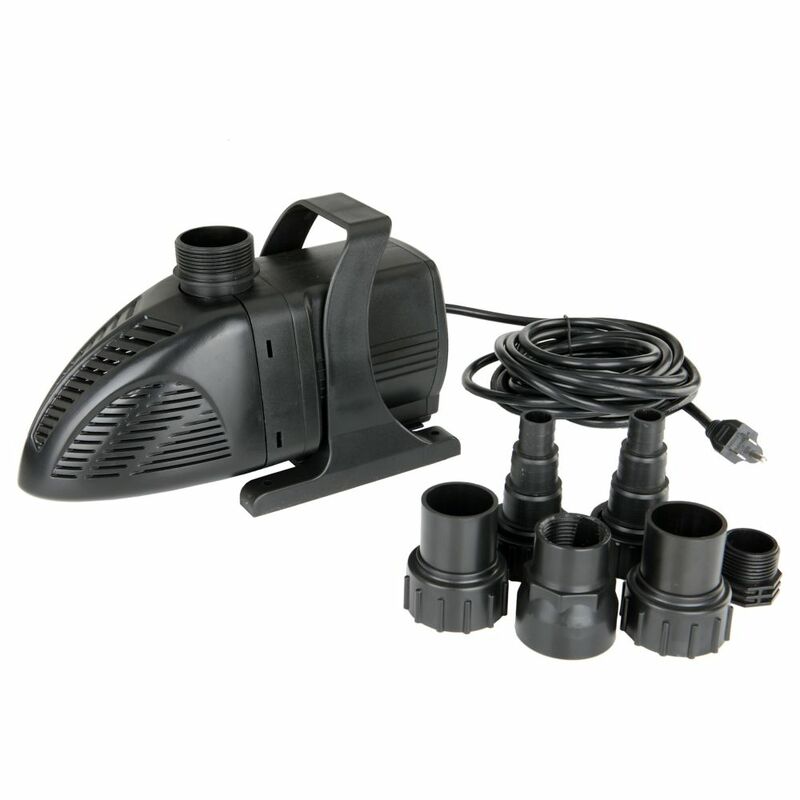 This pump is most suitable for fountain and pond use, and includes a spray nozzle with five unique spraying features. This 2" Aluminum centrifugal waterpump has NPT threads and is capable of delivering 158 Gallons Per Minute at 36 psi. It comes with a 25mm powder coated steel frame and a 1.8L fuel tank on a Honda GC160 Engine. 2500 GPH Waterfall Pump Create a stunning water feature with ease with this powerful 2500 Gallon Per Hour Pond Waterfall Pump. Engineered for quiet, powerful and reliable operation, this pump is designed specifically for pond use. Ideal for ponds up to 3000 Gallons and waterfall applications. Ultra Energy Efficient (85-Watt). Includes fittings for 3/4 in., 1 in., 1.25 in. and 1.5 in. connections. Compatibility with most pond applications and equipment.